Welcome to Negroni Week, presented by Imbibe Magazine and Campari. Negroni Week launched in 2013 as a celebration of one of the world’s great cocktails and an effort to raise money for charitable causes around the world. From 2013 to 2014, Negroni Week grew from more than 100 participating bars to more than 1,300 participating bars around the world and more than $120,000 raised for charities. 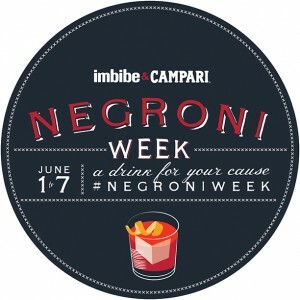 In 2015, Negroni Week will take place from June 1-7, when once again, bars around the world will mix their favorite Negroni variations and donating a portion of proceeds from each one sold to a charity of their choice. Click here to sign up for this year’s festivities. Keep tabs on the Negroni Week action by following the #NegroniWeek hashtag. And, of course, be sure to mix yourself a Negroni!